BRIAN HEAD – Improved weather conditions stopped the Brian Head fire from spreading Sunday and gave fire crews a chance to secure some areas of concerns before more anticipated windy conditions arrive. For the first time since Tuesday, the fire had no changes in growth from the a.m. reports, which showed it to be at 42,800 acres. Additionally, containment is now reported at 10 percent, 2 percent more than Sunday morning. “(It was) a good day for firefighters, who were able to have success securing areas of particular concern, including the many structures affected by the Brian Head fire,” Incident Commander Tim Roid said, describing Sunday’s conditions. Some of the work Sunday was made in anticipation of increased winds Monday afternoon that officials fear may spread the fire to Horse Valley. Efforts involved using a dozer to build an indirect fire line away from the current fire perimeter across the valley. Airtankers then dropped retardant immediately adjacent to the dozer line to minimize the ability of the embers to start spot fires across the dozer line. Monday, crews plan to continue securing the southern perimeter of the fire to slow its progression toward Mammoth Creek. They will also be scouting out ahead of the fire to the north and south to be prepared if the fire activity picks up and moves in those directions. There are currently 11 helicopters, 49 engines and 36 crews comprising 1,140 firefighters. The Type 1 Incident Management Team will assume control of the eastern half of the fire in the morning. Kim Martin will be the incident commander for the Type 1 team and will be based at the Triple C Arena in Panguitch while Roide’s Type 2 team will remain in Parowan. The two teams will work together to protect the values at risk and coordinate the full suppression of the fire. Current evacuations – The following communities remain evacuated per local law enforcement: Panguitch Lake, Horse Valley, Beaver Dam, Castle Valley, Blue Springs, Rainbow Meadows, Mammoth Creek, Dry Lakes, Second Left Hand Canyon and the town of Brian Head. Evacuees can contact the Red Cross for shelter information. If you live in an area affected by wildland fires, officials recommend familiarizing yourself with the Ready, Set, Go Program. Closures – Highway 143 is closed from the cemetery in Parowan to milepost 50 outside of Panguitch. Mammoth Creek Road is closed at the junction with Highway 143. The north side gate of 143/148 is closed. The Dixie National Forest has expanded its area closure. Please check your route before planning recreational activities. 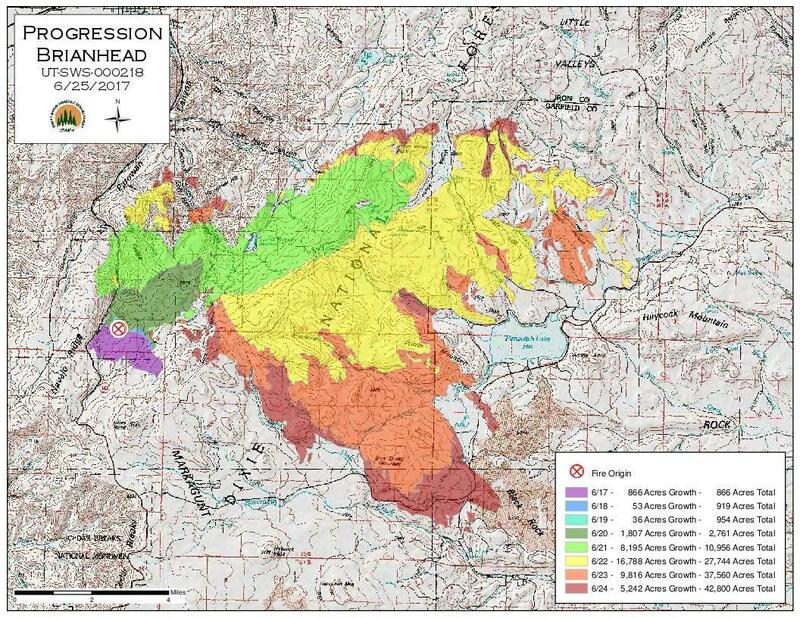 Maps and a thorough description of the closure area are posted at the InciWeb incident webpage.